The green Portland State hat ﻿Taya de Alba﻿ wore to her signing on Monday looked a lot like the green of St. Patrick-St. Vincent High School. The rain on Monday afternoon might have been similar to the Pacific Northwest as well. The St. Pat’s senior signed a letter of intent on Monday in front of coaches, teammates and classmates to play with the Vikings next year. She expects to pitch and play some first base and third base. De Alba plans to study business and administration or business and management. Portland State was 8-36 and 3-14 in the Big Sky Conference last season. 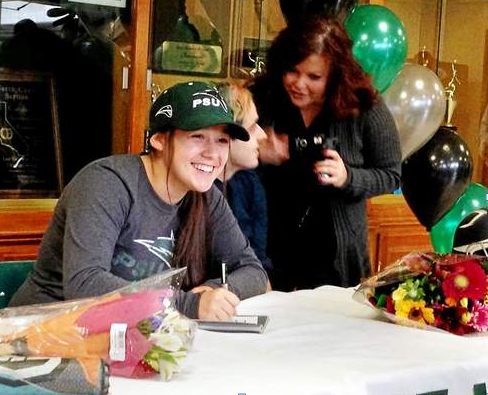 The coaches at Portland State recruited her while she was playing on the Bears 18 Gold team. De Alba, who was also recruited by Holy Names, was sold after a trip to the school where she got to meet coaches and players in person. De Alba will be playing her fourth year on the varsity program at St. Pat’s this spring. Not the hardest thrower, de Alba has helped pitch the Bruins to the North Coast Section playoffs due to her excellent control and strong mental attitude. She said her mental game is the main thing that has improved in the last few seasons. De Alba has been the Bruins top starting pitcher since her sophomore year. While the Bruins have posted a 43-17-2 record the last two seasons, they have lost to Salesian in the North Coast Section finals the last two years.